Champa de Silva, a private sector employee from Borelesgamuwa, frantically looks along the empty counters that were once filled with packets of powdered milk. Her five-year-old daughter Dakshi loves her daily glass of warm milk but Champa doubts whether she would find any milk powder in the market today. “We have been going to many shops searching for milk powder. The supermarkets only have non-fat milk powder. Last week, I bought a few packets of Maliban milk. Though the price is higher it was the only brand that was available at the CWE Sathosa outlet,” she said. Champa is not the only desperate mother searching for powdered milk; mothers who have weaned their young ones onto formula milk are in great trouble. 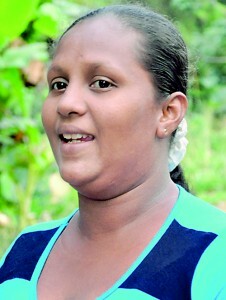 Shiranthi Nisansala (36) is a mother of three from Nugegoda. Her youngest, one-and-a-half years old is given milk made from milk powder. “Without a refrigerator and with three children, milk powder is the only option for tea and milk for children. The monthly requirement is about three kilos and we buy in 400g packets,” she said. Many supermarkets witness desperate parents looking searching through counters hoping to find at least one packet of milk. 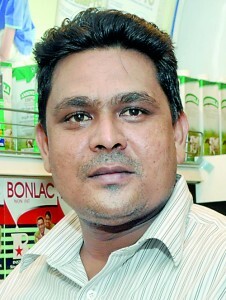 Lasantha Gunawardane from Thimbirigasyaya, Colombo said parents were helpless. “There are no 250g milk powder packets in retail shops. Brands like Nespray and Lakspray have not been available in retail shops and supermarkets for more than two months,” he said, adding that smaller shops were hoarding milk powder and reserving stocks for known customers. Sri Lanka Housewives’ Association President Ameena Mohommed Ali said the recent strike by employees of state-owned Milco, which produces Highland milk, had severely affected supplies. “There is a belief among many mothers that liquid milk triggers phlegm problems and is not recommended for children suffering from respiratory illnesses. 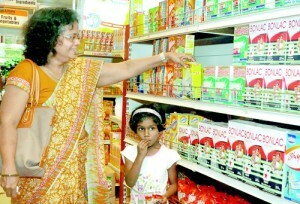 Children too ask for tea or milk made from milk powder,” she said. Ms. Ali said parents with children aged from 5-10 years were in particular difficulties, even resorting to using condensed milk as an alternative. 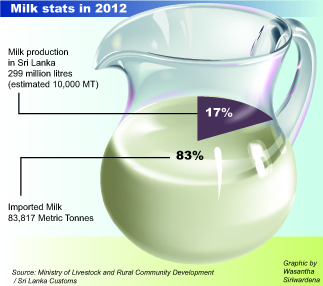 According to the Ministry of Livestock and Rural Community Development, Sri Lanka’s domestic milk production is about 17 per cent of total sales; the rest is imported. Customs statistics show that in 2012, the country imported 83,817 metric tons of milk powder while only producing 299 million litres of liquid milk domestically. Local production of milk powder is estimated at 10,000 metric tons annually. 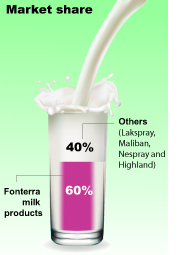 The Sunday Times learns that Fonterra group’s Anchor and Ratthi brands control about 60 per cent of the market followed by Lakspray, Maliban, Nespray and Highland. Shop owners and managers of supermarkets are facing a dilemma as customers complain of the shortage. A manager in one large supermarket chain said there had been no Nespray or Lakspray for several months and the quantity of Highland milk powder was so low that stocks were over within a day or two. Counters that were once full of powdered milk now have malted drink products and non-fat milk powder. “We cannot keep these racks empty. Customers are complaining but if the stocks are not arriving in time we are helpless. Milk powder distributors say that the dicyandiamide (DCD) clearance takes about 26 days. As there is a big demand, when limited stocks do arrive, people buy in large quantities and quickly exhaust the stock,” he said. Pradeep Jayaratne, manager of another supermarket chain said his outlet was able to supply only 2 per cent of the monthly demand. Consumer Affairs Authority (CAA) Director-General J.M.A. Douglas said that as powdered milk was not considered an “essential” item the Consumer Affairs Ministry would not be driven to take swift action. The CAA would study the financial status of the companies and decide whether there was a need to increase prices. He said that the CAA had not received any complaints over a shortage from consumers and that it was only after a complaint that the CAA could take action and look into the reasons behind a shortage. Mr. Douglas said the price of Maliban milk had been increased without approval from the Consumer Affairs Authority, which controls the prices of commodities. “As the CAA had not responded to the milk powder company’s request within a month Maliban took advantage of the legal provision and increased the prices of a 400g packet by Rs 70. and a kilo by Rs. 190,” he said that (according to the Consumer Affairs Act the CAA had a month to respond to a company’s request). Maliban is sold at Rs. 395 for 400g and Rs 995 for 1kg. Other brands currently sell a packet of 400g milk powder for at Rs. 325 and a 1kg packet for Rs. 810. The Director-General also said that three special teams apart from district teams had been deployed to inspect warehouses of milk powder manufactures, importers and distributors. Last week, the CAA issued a gazette notification directing all milk powder importers, manufacturers and distributors to store milk powder only in registered warehouses and to open these premises to the CAA for inspection. The gazette notification was issued following the raiding of two warehouses in Welisara and Seeduwa. In Seeduwa, CAA found more than 250,000 400g packets of Nespray and another 12,000kg of milk powder stocks at a Lanka Milk Foods warehouse in Welisara. On Thursday, Co-operative and Internal Trade Minister Johnston Fernando said 10 container-loads of milk powder were lying at the port without being released to the market. Several attempts were made to contact leading milk food importing companies for comment on this story but there was no response. Fonterra’s Anchor and Ratthi milk powder that comprises about 60 percent of the milk powder market here said that with global dairy prices at record highs, they are unable to increase production to levels that meet current market demand. “We have been absorbing these costs for many months; however, as international prices have continued to increase, we have been talking with the relevant Government authorities about a retail price increase,”New Zealand’s Fonterra said in a statement to the Sunday Times. It said the increase in global dairy prices had significantly increased the cost of production for all milk powder importers. “We are committed to supplying high quality dairy nutrition to Sri Lankans and are working closely with the relevant Sri Lankan government authorities to find a solution to this current industry issue,” the company’s statement said. Regarding the recent statement by Minister Johnston Fernando, that 10 containers loads of milk powder are at the port without being released, Fonterra said that the consignment at the port are currently undergoing the standard clearance process. “Once complete, these containers will be transported to our manufacturing facility for processing into product,” the New Zealand based milk powder company stated.